This is one of my all time favourite recipes – fun to eat, easy to cook, and a great choice for promoting gut health as well, due to the rich content of fibre from the lentils and veggies. Lightly spray a hot pan with oil. Stir-fry garlic and pork mince. Add all herbs, spices and vegetables except for the lentils, and stir until combined. Add soy sauce and oyster sauce to a small dish and add ¼ cup water, then add to meat and vegetable mix. Stir until combined and nearly cooked. Add lentils, combine with rest of the ingredients, cook for another minute. 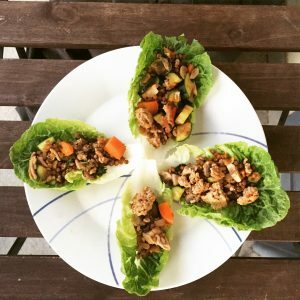 Spoon mixture into lettuce cups.